Limit 1 per person. Valid toward jewelry. Valid toward regularly priced items only. Promotional value expires 365 days after purchase. 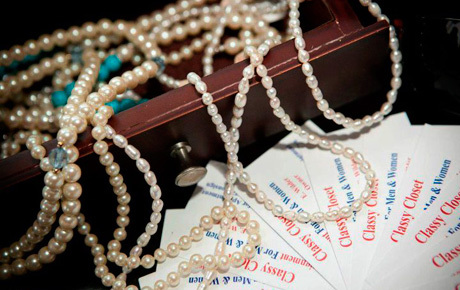 Give your look a little glitz with 50% off modern, classic and vintage jewelry at Classy Closet Consignments in Evanston ($20 value). Enhance your wardrobe with classic bracelets, brooches, necklaces and other shimmering accessories. For nine years, Classy Closet Consignments has refurbished men and women’s attire by offering affordable clothing and jewelry options to the community. This consignment store holds an assortment of ornamental jewelry for men and women, including lustrous earrings, watches and rings that will add a radiant glow to any ensemble. With two floors filled with apparel at your disposal, you can find the right threads to compliment your new jewels. Find affordable accessories with this classy deal.